Google’s Gmail email client is the most incredible tool for managing your inbox. You need this. If you’re not fully convinced by the end of this series that Gmail is the email tool for you, leave me a comment and let me know why. Trust me when I say it’s the absolute best way to manage your emails. You can (and should) use your own custom email address and don’t have to use a generic xxxxxxx@gmail.com email address by signing up for Google Apps. You can import old emails from your old email client into Gmail so you won’t lose anything or have to work in two different places. You can manage multiple email addresses (sending and receiving) from different domains all in one place. Note: If you’re already using Gmail, no need to transfer to Google Apps. You’ll be able to do everything I’ll be talking about in this series with Gmail. Google Apps gives you access to all sorts of Google tools that are useful, but today we’re simply going to focus on emails. Use Google Apps to set up your custom email address using your domain name. For example, contact@themoderntog.com. Even if you don’t have your own hosting yet, it’s only $10 a year to get your own domain and set up an email address, and it looks SO much more professional, so do it. Google Apps is free unless you have more than 10 employees using it at your business. Please note that the “free” version is different than the “Google Apps for Business” version that they talk about on their website. 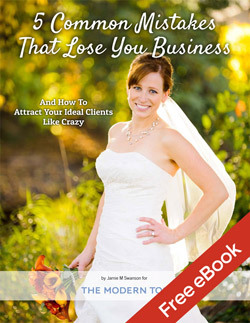 The business version is a paid product that is geared towards companies with multiple employees. Google does a good job of walking you through all the steps of getting your Google Apps account setup, so I’m not going to rehash it here. If you have any problems and simply want to hire someone else to do it, I highly suggest contacting William Bay and he will take care of it for you. The first thing you’ll want to do is import all your email from your current email client so that you have a copy of all of it in Gmail. They do a great job of walking you through this, but if you need additional help you can find it about half way down the page here, under “Individual Users / Client Side”. If you are starting a new email address, you’ll want to set your old email address to forward to the new one. If you are moving an email address you already use with your custom domain, then don’t worry about this step. 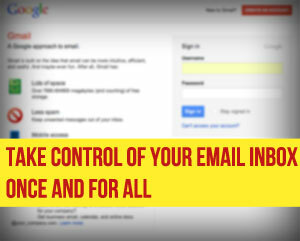 Task for Day #1: Get set up with Gmail. I promise you won’t regret it. Here’s a rundown of what to expect over the next week. Each post goes deeper into the usefulness of Gmail and many build upon the parts before it, so make sure to follow along so that you have everything set up the way you need it to be. In the meantime, I’d love to hear what your biggest frustration with email is. Leave a comment below and let it out! Trust me, it feels good. Go ahead. Click to go to Part 2 of the Series.